Situated on Palmeras Plaza.Family friendly, overlooking a gently shelving communal swimming and children's paddling pool. Each of the 6 plazas have their own pools. Town center is a 15 minute walk along the beach front promenade. The nearby award winning beach has water sport and wind surfing facilities. Accommodation is all on one level. Children and adults can enjoy a peaceful relaxing vacation. No roads to cross on the complex. There are a number of bars, shops and restaurants within 5 minutes walk. The resort is at the start of the coastal path along the ocean. The Mai Tai island has been upgraded and stays open late in the evening.Giving beautiful views over the ocean guests can enjoy breakfast, lunch and dinner in the Lido coffee shop. Free nightly entertainment for children and adults. The property in 2005 to enjoy the facilities of Sands Beach. It is a home from home to appreciate the year round climate of Lanzarote on regular visits and vacations to the peaceful resort of Costa Teguise. The property is owned by a Spanish company - Moonstone Patrimonia Familiar . The apartment is located on a quiet well equipped resort on the beachfront. Costa Teguise is a family holiday centre with a wide range of bars and,restaurants. An extensive range of day trips are available. Bathroom with bath/shower over, WC and bidet. Separate dressing area with a spacious marble dresser with shelf for toiletries. Twin recessed hand basins and hair dryer. 2 space heaters and an oscillating ground fan. Ceiling fans in the living room and bedroom. Front loading automatic washing machine. There is a laundry room on site. Available at front of resort and on street parking. There is a computer area in the bar area at the front of the resort with 3 computers (local charges apply) Wifi in the Soliel bar at no cost. Bath and hand towels provided and changed weekly. Beach towels, if required. can be hired on the resort. Available for a local charge. New fully fitted kitchen installed 2018. Approximately 25 English language channels including BBC1 ,BBC2 , ITV1 , Channels 4 & 5 , Film 4. Wide selection of books in the apartment. Books can be swopped in the Soliel Bar. Previous guests have left a suitcase of toys. There are a number of hire shops available, including on the complex. Veranda has views over the pool. Outside table, parasol and 4 chairs Perfect to enjoy a meal or sip a glass of wine and watch the world go by. Available on the beach front. Notes on accommodation: Family friendly resort ideal for adults and children. The well equipped shop on the resort has a wide range of groceries and newspapers. It is open 8 am to 12 pm 7 days a week. A cycle rental outlet is on the complex. It is open 9-12 am and 7-9 pm daily. There is a car rental agency in the reception area. Other agencies available locally. A luggage room is available just behind reception. Outside: Directly outside the villa is a tiled patio area with table, chairs, parasol and sun lounger opposite a gently sloping swimming and paddling pool. There are sun beds and loungers around the shared gently shelving pool and toddlers splash pool. One of the plazas has an 8 lane swimming pool. Live entertainment for both children and adults each night. There is 24 hour security. Utility Room: Front loading automatic washing machine installed. Iron and ironing board in the apartment. 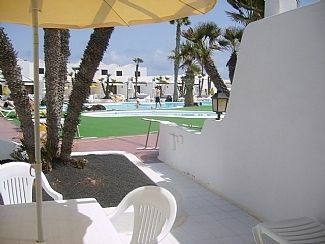 Laundry facilities are available on site and in Costa Teguise. Cleaning equipment. Cleaning / Towels / Linen Bed linen and towels provided with a midweek towel change. Weekly cleaning service provided. Utilities included. Beach towels can be rented from the resort for a charge. We have just returned from a fantastic week , the apartment has everything you need with a lovely kitchen that allows you to eat in if you prefer. The pool is great and with the apartment location you can sit on the balcony whilst watching the kids. Lots for the children to do, play area, basket ball, table tennis and pool. Great 5 mile run along seafront. Lots of shops, supermarkets and restaurants all within walking distance. Great communication from owner that left me reassured when booking. Thank you, we hope we looked after your apartment and hope to return in the not so far future. Everything you could wish for available here. Lovely apartment, comfortable bed, clean and spacious areas. Lovely his and hers vanity area, pool side loungers and large sitting room area with large tv. Location of apartment one of the best. It is so near the complex entrance, reception, supermarket and bar/restaurant. Sands Beach is surrounded by a choice of beautiful restaurants. Situated by the beach, just a short walk it has everything you would need. Had a week in this apartment in November, very good value, great resort in Costa Teguise while on the edge of town it’s a short walk to great restaurants and beaches. I’d return again very happily. Excellent apartment on a good resort. Property is a large 1 bed apartment with kitchen/washer dryer. Drop down double bed in lounge allows for 4 to stay comfortably. Excellent location close to main building so no trekking any distance across the site with your bags. Faces directly out to the pool and with all units has large sliding double doors, so nice and cool with Lanzarote sea breezes. Perfect location and great value for money. Loved the location as been about 15 times or more. The apartment a little tired, cupboard doors need TLC, new sets of crockery, glasses and new pans need replacing. Recommendations would be to update the villa, provide new pillows as ones provided were flat and only one pillow per person. Door curtains off the hooks. Overall this did not spoil the holiday but just a tip. The new white goods comprise hob, oven ,fan, dishwasher, built in microwave cooker ,fridge freezer. The walls have been retiled and the lighting recessed. The work surface is marble. The flooring in the apartment has been replaced and fully retiled. The resort is situated on the seafront. La Cucharas is a 5 minute walk along the promenade and offers a range of water sports. A coastal path runs alongside the complex and gives traffic free peaceful walks from the complex through Costa Teguise in the direction of Arreciffe for approximately 2 - 3 miles. The local bars, shops and restaurants give access to the beach. The airport is a 20 minute drive to the resort with taxis costing approximately Euros 23. Car rental is available at both the airport and locally. The taxi stand and bus stop are both a 2 minute walk from the resort. Regular bus travel is available to Arreciffe, Peurto Del Carmen and on to Playa Blanca from a bus stop 300 yards from the complex. This is beside the taxi stand. There is a range of tourist leaflets in the apartment and reception. The centre of Costa Teguise is a 1 mile walk along the main road or coastal path. Arreciffe is a 15 minute drive from the local bus stop, 300 yards from the resort. A car is not essential. Puerto Del Carmen is a further 15 minutes on the same bus. The airport is 20 minutes away. It can be reached by rental car, taxi or transfers. Golf, surfing, horse riding, trekking, cycling, deep sea fishing are available close to the resort. There is a range of tourist leaflets and restaurants details in the reception. The reception is manned 24 hours per day. There are approximately 140 DVDs in the apartment. A limited range of DVDs can be borrowed from reception to play on the DVD player in the apartment. A refundable deposit of Euros 20 secures the DVDs from SBV reception. An internet cafe is on the complex consisting of 4 terminals in the bar area. Wifi can be obtained for the apartment (local charges apply). Wifi is available free of charge in the Soliel Bar in the resort and in bars and restaurants in Costa Teguise. The bar in the resort shows various sporting / football games as does the Sports Bar across the street.The tourist bars in Costa Teguise show a wide range of sporting events. Costa Teguise is well known for wind surfing. Facilities are available on the beach. There is a Sunday market close by in Teguise. Volcanic landscape - Timanfaya National Park - live geysers and boiling pools. Cueva de los Verdes - caves and natural rock formations formed 3,000 years ago. Jameos de Agua - water caves formed by volcanic eruptions - swimming pool, bar, restaurant and concert hall. Coastal fortresses - Santa Barbara, 16th century. El Golfo - huge crater - filled with water and algae. Booking Notes: Email or telephone to check availability and price. A deposit of £200 is required at the time of booking. Balance due 2 months prior to departure. Full arrival instructions will be emailed on receipt of the final payment. For late bookings a discount of 20% will apply to bookings within 4 weeks of arrival. Cots £15 per week, high chair £15 per week. Changeover Day: Changeover days are flexible. Guests may access the villa from 2 pm on the day of arrival. Please vacate by 10 am on the day of departure to facilitate the cleaning / management company and incoming guests.. It may be possible to vary these times nearer the holiday dates if the previous or following days are not booked.